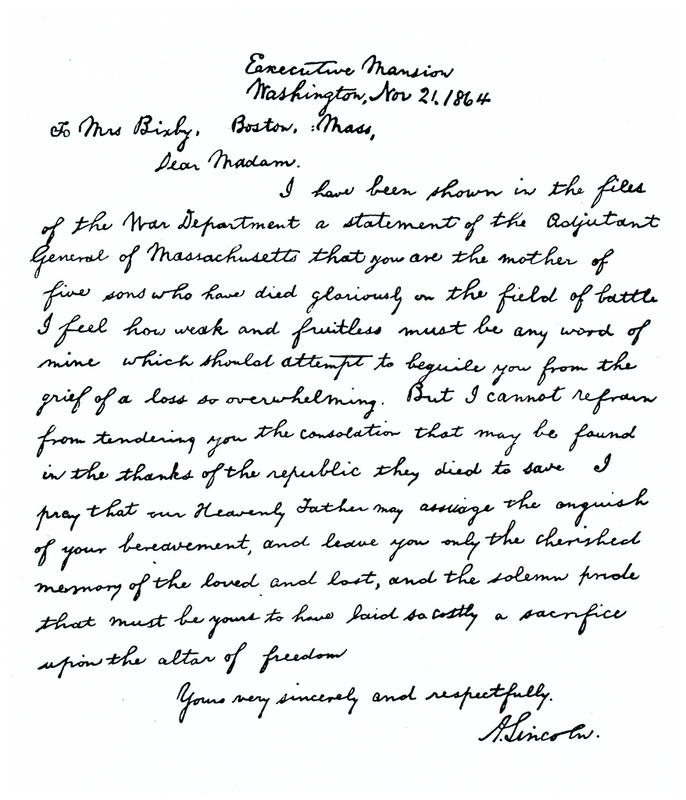 November 21, 1864: Lincoln (allegedly) writes a letter of condolence to a Mrs. Bixby of Massachusetts, whom he was told had lost five sons in the war. Mrs. Bixby herself was a Southern sympathizer. Some modern historians don’t think Lincoln actually wrote it, but rather, his secretary, John Hay. None of which diminishes the majesty of this prose and the incredible command of the English language. I fell in love with this letter a long time ago, when I literally found a copy in a little book, in a pile of trash in the closet of an old house we were cleaning out. (Anybody else remember, “His Place”?) The book was an anthology called “One Hundred and One Famous Poems, with a Prose Supplement.” Not exactly an elegant title, but a great collection, none the less.